Try something new everyday. 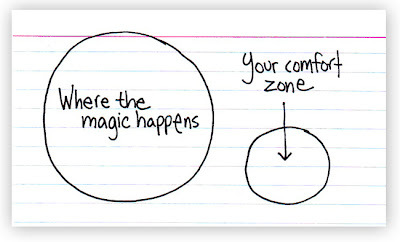 You never know what magic might happen. Everyones' lives are like a very long sidewalk. Some are well paved. Others have cracks, banana skins, and cigarette butts. Your sidewalk maybe will be like mine, but probably not as many cracks. Or maybe more. But hopefully, one day our sidewalks will meet, and together we can share a bar of chocolate, and talk. As a 14-year old headed to my first bicycle race at Bear Lake, I awoke to a strange sound of wet splashing around the car. Curled in the back of the family 4-Runner, I hazily came out of sleep and confused, tried to identify the sound. The wet sound came from the windshield-wipers slinging slushy water back and forth across the glass. I buried my head in my blankets, afraid to tell my dad. The weather report the night before called for mostly sunny skies with a 20% chance of rain and being so young and inexperienced, I brought only my jersey, shorts, helmet, and shoes. I did not bring a rain jacket, shoe covers, warm tights, or ear warmers—and sitting up looking at the rain, I was afraid to tell my dad. Eventually I confessed to my planning ahead failure and thinking quickly, my dad helped me improvise. Inside my shoes we stuffed plastic bags from a gas station to keep my feet warm and fashioned leg warmers out of wool socks with the toes cut off. With my plastic booties, makeshift tights, and a size-too-large jacket borrowed from another racer, I started the race and battled three hours of wind and rain to cross the finish line alone and in last place. And thus began my cycling career. This morning, 6 years later, I drove myself to race Antelope Island—an event notoriously miserable in windy and rainy conditions. Similar to 6 years ago, the weather report last night indicated a 20% chance of rain; however, as I am now wiser, I came prepared anyway. Then again, I arrived to the parking lot 30 minutes late with an unprepared bike. Some things never change. In a frenzied rush I swapped my cassette from my training wheels to my race set only to find my unchecked tubular had a defective valve stem. I suppose I should have squared away that maintenance the night before. At least I managed to put the front race wheel on my bike. After reswitching the rear cassette and with 5 minutes to the start, I registered, begged the lady at the table to pin on my number, and zipped back to the car to grab the water bottles and booties I had forgotten. I arrived to the starting line 5 seconds before the group rolled out and riding with a $1000 race wheel on the front and a $100 training wheel on the back, I joined the pack to begin our race around Antelope Island. As we left, the clouds above let down enormous amounts of rain and hail. In my rushed state, I had forgotten my rain jacket. Some things never change. Having survived the rain and the cold, I sit now smiling at the similarities and differences between today’s race—my first in almost 2 years—and my first experience at Bear Lake so long ago. Today, I drove myself; but throughout the day I thought of my dad often and how he sacrificed four years of Saturdays and Sundays to drive me and my bike to races throughout the region—often getting up at 4 am to drive while I selfishly slept in the back. I smiled as I thought of him rolling his eyes at my lack of preparedness and I wish he would have been at the finish line today as I rode in cold, alone, and almost in last place. Yet, there are the comforts of a cycling race that will never change. The race officials are still wonderful and the other racers still pleasant. My thanks go out to Richard and Holly Blanco, Harry Lam, Cindy Yorgason, Gary and Lousie Bywater, and all of the other officials who have supported and encouraged me throughout the years; it was great to see a few of you today, as miserable as you looked in the rain. And of course, no tribute to cycling would be complete without a note about Terry McGinnis—an amazing coach and a dear friend we all terribly miss. I drew motivation from Terry’s enthusiasm for cycling and his passion for life and I thought of him often today. I hope he knew how much he influenced my life and made me a better cyclist and a better human being. Good luck to all those racing! I look forward to an interesting and exciting season! And therefore, I buy lint rollers in bulk. I don't write poetry. I read it, but I don't write it. However, a recent assignment forced my prose-dedicated brain to experiment in that fantastical world of poetry. And apparently, it was well received by my professor. Any followers of my blog will recognize the subject and location as I have previously written a post dedicated to my happy past. Hopefully, you will enjoy the same idea in a different format. My red and yellow horses. The few trees still standing are the shadows of what once was. And watch the water ripple. Because in my mind, it is still real. The horses would lie under the trees, snuggled up to the grass. The barn was in the West. And dream of my childhood fairyland. In an effort to keep up with my “expressive” writing, allow me to share a night in Paris.This summer I traveled to Montenegro and the surrounding Balkans with my family to visit our family friends. After a wonderful two week stay, we boarded our plane and unwillingly flew west towards home. After a layover in Serbia, we continued onto Paris where our flight itinerary dictated we must stay the night. No one protested. Taking advantage of our 24 hour jaunt in the Parisian capital, we immediately boarded the subway and made our way into the City of Lights. We exited the train at the stop “Hotel de Ville” and began our exploration of the city. 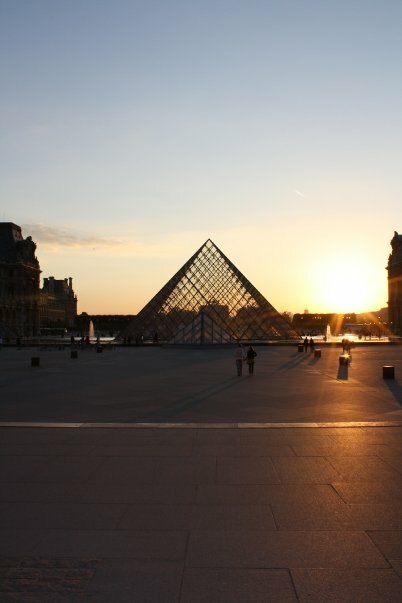 While all of the buildings were beautiful, le Musee du Louvre wore a particular golden crown of perfection that night. The sun was finishing its long summer day and approaching the western horizon as I walked under an archway into the Cour Carrée, a large courtyard showcasing Pierre Lescot’s Renaissance façade. Unseen, an old man was playing a violin under one of the entryway arches and the music echoed across the nearly empty courtyard. The setting sun splashed golden rays onto the exterior of the Louvre turning the stone into a golden masterpiece and the center fountain began splashing liquid gold. I made way across the courtyard towards the west and after exiting through another arch, I came into view of the Cour Napoléon and I.M Pei’s great pyramid. Before descending the stairs to the pyramid’s level, I stopped at the closest window. Standing on my tipsiest tippy toes, I caught a glance of the gold gilded ceilings of the interior. Surrounded by a golden palace, housing golden ceilings, I looked towards the pyramid and marveled at the architects of past and present. The truth is, what I love more than anything is art history—and standing next to the world’s greatest museum basked in such glorious colors proved to be magical night. Just for me. I grew up in a magical place. Magical and perfect. My childhood home sat in front of 40 acres, complete with towering trees to climb, a small river and pond to splash in, and mazes of bushes and shrubs so large, I never explored them all. The area was known as “The Hollow,” due to its location in what I'll call, a ravine. There were many hills to trek up, and although none were very large, I felt like a conqueror each time I crested the top. Many hills climbed above the ravine and had spectacular views of the surrounding mountains; I would sit at the top for hours, soaking up the beauty around me. Now, the Hollow is a housing development and a tattered, depressed shadow of what was once my paradise on Earth. Often, I like to think when I die, my spirit will revisit that happy place as it used to be, perfect and intact. I’ll hop over the fence near my house and joyfully walk across the grassy plain to the pond, shaded by large willows and filled with stinky moss. I’ll trot down the hill adjacent to the pond and climb aboard the rope swing—a dangerously old, insecurely hung, fraying piece of rope with a sharp-ended stick loosely knotted at the bottom to serve as a seat. Apparently saftey was never my concern as a kid. I’ll climb up to a platform on the tree and jump into flight. I’ll lean my head back to let my hair swish about my head and I’ll peer up through the dark green, intertwined leaves where I’ll see patches of perfect blue. I’ll swing back and forth through the dancing light, swirling and swimming between earth and sky, green and blue—smelling the fermented rot of old leaves against the new buds of growth; and listening to the splish-splash of the river over little rocks and large pebbles until my worries and frustrations have no choice but to give in to the serenity of this peaceful place. Maybe it will be fall time and the crisp air will match the crisp leaves crunching under my feet as I walk through tunnels of pumpkin orange, cinnamon-candle red, and hard candy lemon yellow. The air will smell like frozen sagebrush and frozen dirt—and all will be wonderful. Or maybe it will be winter with the sounds of happy children sledding down the hills. Or Spring time when the purple flowers grow and the cotton trees release fuzzy white snow onto the freshly green grass. Or maybe it will be the lazy summer, when all is hot, muggy, and still. Regardless, all will be happy, all will be joyous. I miss the Hollow. I wish I were still there. I am hopeful, however, that one day, in some form, in some way, I will return to partake in its perfectness. Thank you, God, for giving me the perfect childhood hollow to grow and to learn through. Thank you for keeping it alive and sacred in my heart. It will always be my favorite place.